Today is the deadline for NHL teams to issue qualifying offers to their restricted free agents. There were only two players who played for Texas this year who received offers. Cameron Gaunce and Scott Glennie were the only two players to receive offers. Ryan Button, Hubert Labrie, Dustin Jeffrey, Austin Smith and Tristan King did not receive offers. They will become unrestricted free agents now and are free to sign with any team. Jeffrey is likely the only player who will garner NHL consideration among the group. This is mostly what I expected with regard to the RFA group. Gaunce and Glennie were the only sure things in the crew. Smith and King were the only certain "no"s. Among the toss-up group, none of the RFAs were offered. Hubert Labrie and Ryan Button will probably garner AHL interest this coming season. Tristan King may head to Europe given his limited success this past season in the ECHL. Austin Smith has already signed in Finland. Dustin Jeffrey has the potential to be a quality veteran add, a la Chris Mueller, for another NHL team. He can be used in a similar role, being a top minute AHL guy who also can plug holes in the NHL roster when needed. Dallas must feel they have other players who can do that now, whether that is Travis Morin or a re-signed Chris Mueller. Either way, it's not Dustin Jeffrey. Free agency starts tomorrow. Most of the players who will play at the AHL level next season won't start coming off the board until July 5th at the earliest. Banner Year for Scott Glennie Makes His RFA an Easy "Yes"
With a high draft pick come high expectations. Being drafted in the top 10 of the entire draft class puts an immense weight on the shoulders of any eighteen year old. 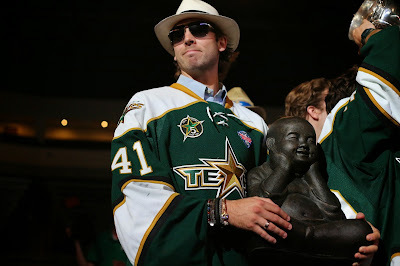 After being drafted eighth overall in the 2009, Scott Glennie is very familiar with having the hopes and dreams of a franchise placed on his back. After several seasons marred by injury, Glennie is a restricted free agent coming off a big performance in the Calder Cup playoffs. His improvement and potential upside for the Dallas Stars make it easy for the NHL club to extend him a qualifying offer by today at 4 PM. Glennie missed the start of the season and also some time in January due to two separate injuries. Intense work during those injuries on the parts of his body that he could work out was a clear difference this season. Stars strength and conditioning coach JJ McQueen made frequent visits to Cedar Park to help with recovery and strength building with Glennie. It seemed like something was different with Glennie this season. It was like he knew this was a make or break year. He absolutely broke out in the playoffs, putting up six goals and four assists in twenty games. He had two multipoint games, including a two goal, one assist effort in the first game of the finals. After that game, Glennie recognized his injury history and called out the luck he's had to get to where he is, "I've been playing with injuries the last couple years. To be playing with the guys I'm playing with and be given the opportunity I have, I'll take it." With his annual contract value currently just under a million dollars in the NHL, his qualifying contract would not be that expensive for the team. He will probably get a well-earned raise at the AHL level, but that will be paid by Dallas, which doesn't affect the available payroll for the AHL-signed players. The question remains of what Glennie's role will be in the NHL. He definitely had what you would consider to be a top six role in the AHL this season. However, he has shown that he can also play a bottom-six AHL role as well. That makes him a very valuable piece. He can be a player who can grind out bottom six minutes in the NHL but can be called upon to play in the top six if needed. He may even excel there. That's his upside. And that upside is why you will see him signing a contract with the Dallas Stars this coming season. Will Veteran Cameron Gaunce Anchor Texas' Blue Line Next Year? Cameron Gaunce sounded like a politician when it came time to speak at the Calder Cup rally, extolling the virtues of the hometown fans. "Every one was taking all my things [to say]," he said the next day. "But it is true. When my mother came, when my sister came with her husband and when a couple of my friends came, they all mentioned the same thing: how nice everyone was." Those fans will officially find out if he will return to wear victory green on Monday when Dallas is expected to announce their plans for their restricted free agents. Gaunce is one of several Texas Stars who are restricted after this season. The fourth year pro is coming off a one-year two-day deal signed last summer with Dallas. Gaunce joined the organization at the trade deadline in a straight up deal that sent Tomas Vincour to Colorado and Gaunce to Dallas. Tomas Vincour played this season in the KHL. Gaunce just won a Calder Cup. It's safe to say Dallas won the trade. Over his career, Gaunce has just 20 NHL games. He was a stalwart piece of the Texas lineup throughout the playoffs and had a huge part in the Cup-winning game. He had three assists. "When you look at our lineup through the playoffs, every game there was someone else who could have been the hero. Whether it was blocked shots, defensive plays or the big time goals, we knew from the start it wasn't a one-line team to win it. In the last game, when a couple of us were benefactors on certain plays, it was par from the course." Gaunce prides himself on his defensive play, so it wasn't surprising to see his relatively low point total in the playoffs. He did end up second on the team among defenseman in plus minus in the playoffs at plus-6. While Dallas does seemed stocked up on defenseman at the moment, Gaunce looks to be a solid defensive defenseman option for the big club. One factor working against him is his pending AHL veteran status. However, it makes a lot of sense to keep a player like Gaunce around to mentor your younger defensemen, act as an NHL callup and contribute his defensive style to the team. "I'm honestly not too sure," said Gaunce of his status for next year. "I feel like I did a good job taking care of my end of things." "You're at the point now where there's a couple of options. You can feel helpless in that there's nothing left for you to control or you can realize that there is nothing left for you to control and move on from it." I thought Cameron Gaunce had a good quote about winning the Cup. I wanted to share it. "The first day you're taken over by the moment. It's hard to look beyond where you are at the time. As the days go on, it starts to sink in how big of an accomplishment you've achieved and how long it took to get there. This year there were over six or seven hundred players in the AHL and in the last couple days, I've had the cup that everyone is trying to achieve. It's slowly sinking in and I'm definitely becoming more proud of our accomplishment." There are a handful of Texas Stars related restricted free agents who did not end the season with the club. The only question mark among the group is Ryan Button, as Austin Smith and Tristan King are extremely unlikely to get offers. All three played more ECHL games than AHL games in their tenure with the Stars and they will both find out their fate with the organization officially when qualifying offers are extended on June 30th. Button joined the Dallas Stars organization almost one year ago on July 4th. He was an add-in piece on the blockbuster Seguin trade. Realistically, the deal could be considered to be separate: a straight up trade of Joe Morrow for Ryan Button. Button was drafted by Boston in 2009 with the 86th overall pick. Button played mostly ECHL minutes this season. He had 33 regular season games in Idaho as a top-line defenseman. He got into 26 games with Texas on the season. Many of those were as a forward, however, when Texas was lean up front in February. He was injured late in the season in Idaho and missed all but one game of the Steelheads' playoff run. Two teams have placed him on the AHL-ECHL barrier, Boston and Dallas. After three years, has he developed enough to try another season? Does it look like he could become a long-term Dallas Star? The answers to those questions appear to be no, which leads me to believe he will not be qualified. Things are a little more clear with Austin Smith. The Texas native came in with a lot of promise after being a scoring machine in college and being a finalist for the Hobey Baker in his senior year. Over the course of his two year pro career, he has played more ECHL games than AHL. He was never able to find his scoring touch in the AHL but had a lot of success in the ECHL. He had 27 goals and 23 assists in 38 games last season in Idaho. This year he started in Texas but was sent down to the Steelheads. It wasn't where he wanted to be and he decided to head to Finland. He finished out the year with Ässät and signed an extension to play with them next season as well. Another restricted free agent who will not be getting a qualifying offer is Tristan King. The skilled forward never could excel at the AHL level and struggled to find a home at the ECHL level as well. He was traded away from the Idaho Steelheads last year after a drug arrest in Las Vegas and ended this season in Evansville. 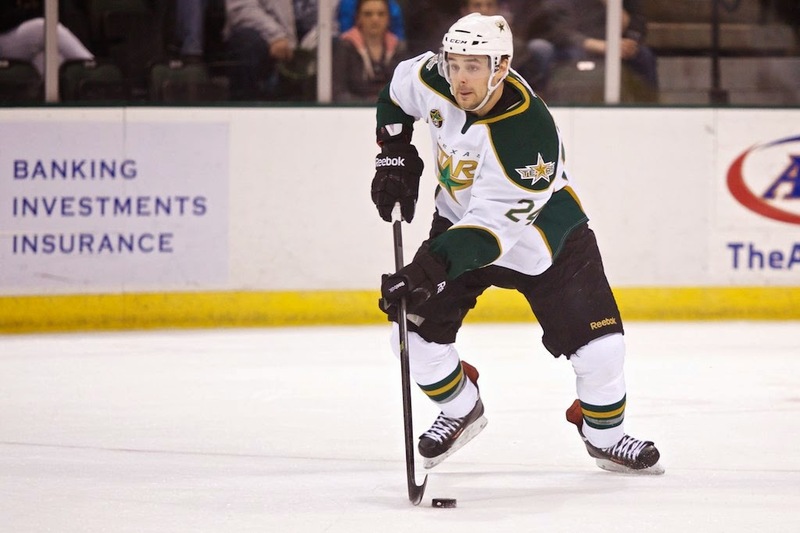 In four years as a pro, he played just 11 games for the Texas Stars. Brett Ritchie's brother, Nick, is expected to go in the first round tonight. All hockey eyes are on Philadelphia tonight as the first round of the NHL Draft will kick off tonight at 7:00 PM. This year's crop of talented youngsters were mostly born in 1996 (!) but will take a few years to make their way to the professional ranks. By way of figuring out when players drafted tonight will start having an impact on the Texas Stars, here's a quick look at the breakdown of when this year's squad was drafted. ^ - Jokipakka wasn't a rookie because of his time in Europe, but this was his first year in the AHL. So if you look at this chart, you can expect that players drafted this year in the 2014 Draft will start to filter into the AHL as ATOs in 2016 and have a bigger impact in 2016-17. Will Dallas Qualify Hard-Nosed Blue Liner Hubert Labrie? Hubert Labrie has never been a scoring machine; that's not his game. But if you've been at a game where he's suited up, you probably know exactly what his game is: solid, hard-nosed defensive hockey. Now the question is whether that hard-nosed hockey will find a home in Cedar Park next season. After playing in the 2009 Traverse City Tournament with Dallas, Labrie was signed to an entry level deal by the NHL Stars on September 18, 2009. He has split time between Idaho and Texas over the past three years and is a restricted free agent this offseason. Jim Nill and crew must extend a qualifying offer to the defenseman by June 30th at 5 PM ET to lock him up for another season. If not, he'll become an unrestricted free agent. 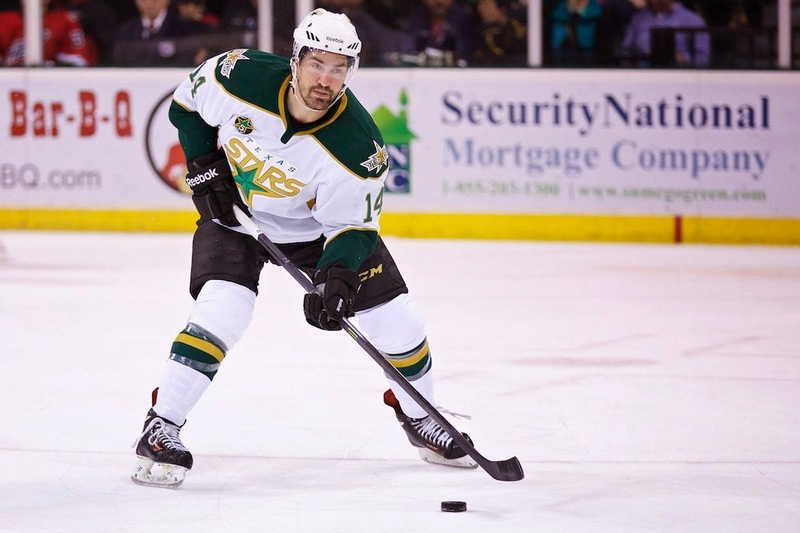 Labrie has played more games in Texas than Idaho each of his three years in the pros. His first year was the tough 2011-12 season, which saw him take a minus-16 in 33 games as an unsheltered rookie under Coach Jeff Pyle. He improved under Desjardins with a plus-4 and plus-11 rating the past two seasons. He even picked up two goals and five assists this season, including a Gordie Howe hat trick against Hamilton on March 29. As Dallas-drafted prospects like Jyrki Jokipakka and Patrik Nemeth continue to roll into the system and jump ahead of Labrie on the depth chart, it was a tough year again. "[Jim Nill and Scott White] know I want to play more, but this was my role as 7th or 8th D. I think I played well every game I was in this season, did a good job. We'll see. I don't now what's going to happen next year, but I hope I'll be back." Factors to consider when looking at a qualifying offer for Labrie are broad. A big picture factor is the contract limit. NHL teams are limited to 50 contracts and the Stars are going to need some open slots to ensure they can sign new and old draft picks and undrafted free agents. Is Labrie worth one of those contract slots for the Dallas Stars? To decide that, you have to look at where he fits in for the overall organizational depth. If you believe that Labrie is a top 4 defenseman at the AHL level, then it makes sense to have him on an NHL contract. If you believe he is a 4-7 defenseman in the AHL, it may not make sense. Take a look at William Wrenn or Maxime Fortunus for examples. Neither were on NHL contracts to start this season. If he is not qualified, Labrie could still transition to an AHL deal in Texas, given the history he has in the organization. He could also sign somewhere else in the AHL where he believes he has a better chance at playing more or getting a better shot at the NHL. If somehow that doesn't happen, he could do something similar to Taylor Vause this year, signing an ECHL deal despite his AHL talent. BY doing so, he would open himself up to making a huge difference as a callup anywhere in the AHL and get an SPC that way. When the Texas Stars got started for the season, Dustin Jeffrey was over 1100 miles away in Pittsburgh. The former Penguin is now a champion with the Texas Stars after a 'mentally exhausting' year. "It was a grind," said Jeffrey. "It was long. Mentally it was more exhausting than physically." Of 82 games in the NHL season, Jeffrey played just 34 between Pittsburgh and Dallas this season. The vet forward was claimed off waivers by the Stars on November 17th, 2013 after playing just ten games with the Penguins. He was on his way to Wilkes-Barre/Scranton to get some playing time, but Jim Nill picked him up for forward depth. "Even when I got to Dallas, I wasn't playing a lot. The mental part of it was harder than anything." On January 25th, Jeffrey was assigned to Texas, where he eventually suited up for 21 regular season games. He was later called up and played out the final month of the season in Dallas, helping the Stars to their first playoff berth in 5 years. He did not dress for any of the Stars first round series against Anaheim and was sent down with Patrik Nemeth and Chris Mueller in time for Game 3 against OKC. He was an instant X-factor for the Texas club. "After we lost in Dallas, having the opportunity to come here and play in the playoffs and be able to contribute and win a Cup is the icing on the cake on the year. It makes it all worth it." Jeffrey played almost as many games in the postseason as he did in the regular season for Texas, totaling 19 games in the Calder Cup run. He put up some huge goals for the squad en route to the championship as well. 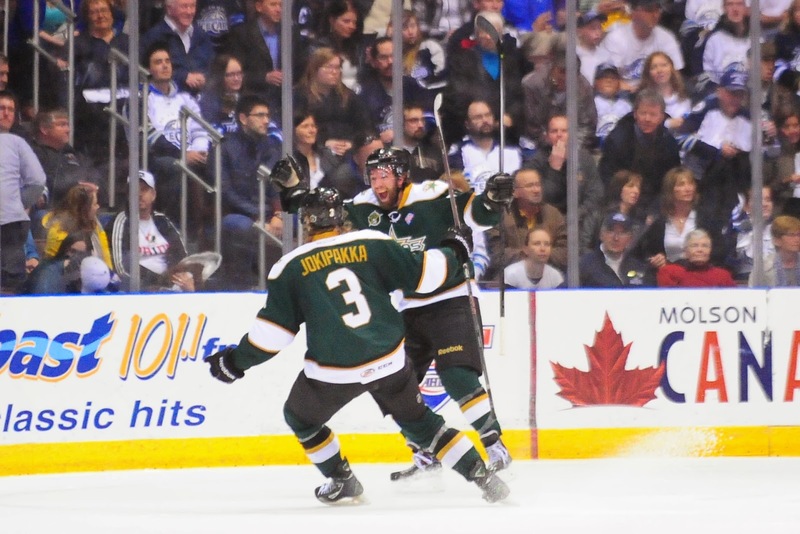 He had two tallies in the deciding Game 6 against Grand Rapids, including the game winner. His power play goal in Game 7 against Toronto tied things up at two and set the Stars on a trajectory to win that game and the Cup. Combined with Glennie and Mueller, he was electric in Game 1 against St. John's with three assists. In all, he had seven goals and five assists, eclipsing his season point total in the most critical games of the year. Now a decision looms for the Dallas brass on Jeffrey's contract status. "I'm still restricted. They have the ability to qualify me, and we'll wait and see what happens. For me, that's my agent's job. Teams know who I am. They know what I can bring. For me, I put the ball in his hands." Jeffrey is one of seven restricted free agents who played for Texas this season. A combination of factors make his qualification a tough one. He can clearly score at the AHL level and is a difference maker for any team who can get him. However, he is a subject to the veteran rule and has to go through waivers to go up and down to Dallas. He is definitely shooting to crack another NHL roster and could probably do so in a number of cities. A number of pieces beyond Jeffrey's control also affect him. What will Dallas do for their 13th forward option? Who will be the veteran callups? Will they be able to re-sign Chris Mueller? Is Travis Morin a legitimate bottom six center in the AHL? If management gave Jeffrey any hints as to their plans, he didn't say anything afterwards. "If you win the last game of the year, it's a pretty easy meeting. They go a little bit better than if you go out earlier. "We talked about why our team had the character and leadership it had and why we were able to never be out of a game. Down 2-0 in Game 7 or 3-0 in Game 4, it didn't matter. We talked about why. It will be interesting to see what happens in free agency this summer." Jeffrey can only do what is within his power though. Among workouts and training sessions, he is also getting married this summer. When asked about honeymoon destination, he joked, "When you go this far [in the playoffs], there isn't a lot of time for a honeymoon." Scott White will be busy over the next few weeks. 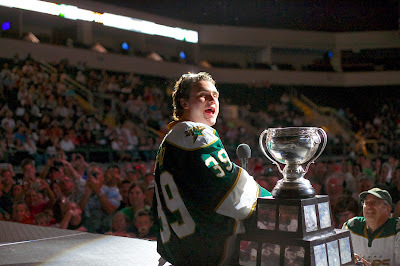 The next five days will start to tell us more about who will make up the 2014-15 Texas Stars. Here is a first look at contract status for the players who ended the year with the squad in 2013-14 and a few extras. After this weekend's draft, the first date to watch will be June 30th at 5 PM EDT. That is the deadline for teams to extend qualifying offers to restricted free agents. As you can see below, Dallas has seven players in that category and perhaps some hard choices to make there. * - Henderson is under contract to Nashville, not Dallas. ** - Desrosiers is under contract to Dallas but will likely return to the QMJHL. ^ - Fortunus is coming off an NHL contract and is rolling back to his AHL deal. As was reported last Friday, Mike Hedden is off to the KHL. After exit interviews, I got a chance to talk to him briefly before he headed off to start his European adventure. "It was a work in progress. A lot of it took place before playoffs. I was originally talking to a team in Finland and looked like I was going to be signing there. Things got delayed and out of nowhere, Croatia came up and started talking to my agent. They shot back and forth and worked something out. Out of respect, I kept it quiet [during playoffs]. "I'm excited. It's a new chapter I'm looking forward to. It's time to go; I'm not getting any younger." "I have no regrets. This is a great organization. It's obviously sad to go because there are such great fans and such a great group of guys. It's a well-knit group. I'm a little upset but it's time to go." "I didn't want to go somewhere where it was just me and one other North American, especially since I'm bringing the 'old lady' with me. That factored into it quite a bit. I'm glad there are a lot of North Americans." "She's excited. Obviously she has a lot of family here, she's from here, but she's excited." "I owe a lot to Scott White. He brought me in three years ago, two years out of D3. I wasn't experienced yet. I wanted to show everyone I could play at this level. They gave me the chance, and I just ran with it." The KHL's preseason starts the first week in August. Texas Stars head coach Willie Desjardins has been named the next head coach of the NHL's Vancouver Canucks this Monday morning. Following the regular season, he was on many teams' radar as a trendy head coach pick. With the Calder Cup win, his stock soared. In addition to being connected with Vancouver, he was also considered in Nashville, Carolina, Florida and Pittsburgh. The early favorite for many was the Vancouver Canucks. Though there were flirtations with the Pittburgh Penguins over the past 72 hours, he ended up with the first team that many speculated on. With Desjardins' western Canada connections, it seems to be a great fit. The Canucks are a team looking to have a resurgence. After heading to the Stanley Cup Finals in 2011, the Canucks are looking to build back to their prior heights. 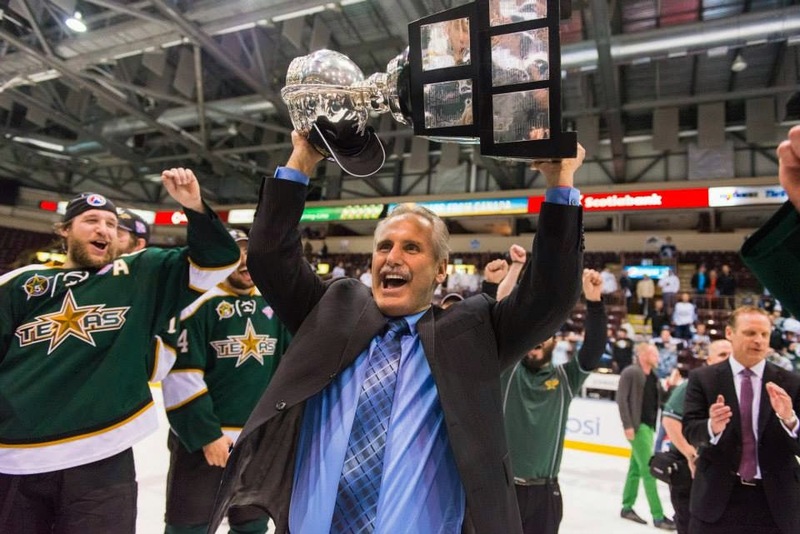 Desjardins has three championships across two leagues so far in his head coaching career and has shown a track record of taking teams to the top. Toby Petersen spoke about Willie's style and his ability to inspire a team. "He's regarded a lot as a players coach. That's not to say he's easy on players. He's actually really hard on players. If you look at the guys here, the comment I made to some of the staff is that guys want to win for Willie. He has that power to draw the team together and pull for each other. We don't want to let anyone down." 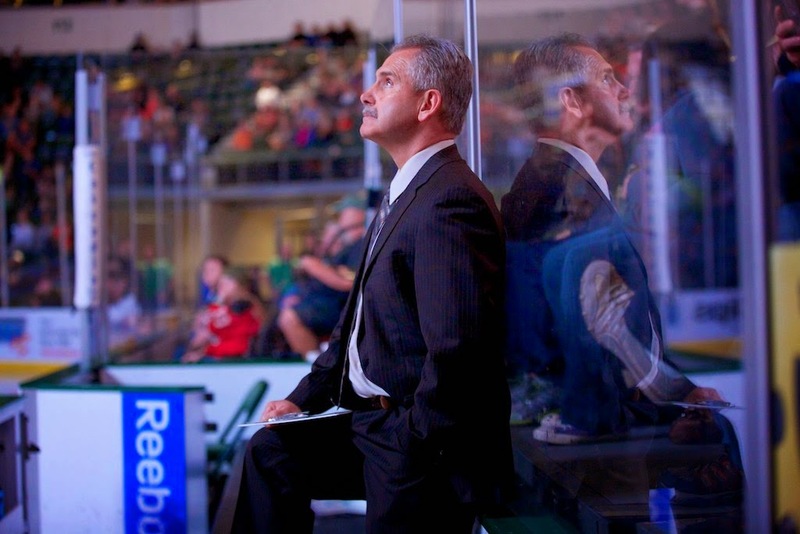 On the home front, the Texas Stars will now look for a new head coach for the third time in their history. The team has twice had their head coach leave to lead an NHL squad, a pretty solid track record. 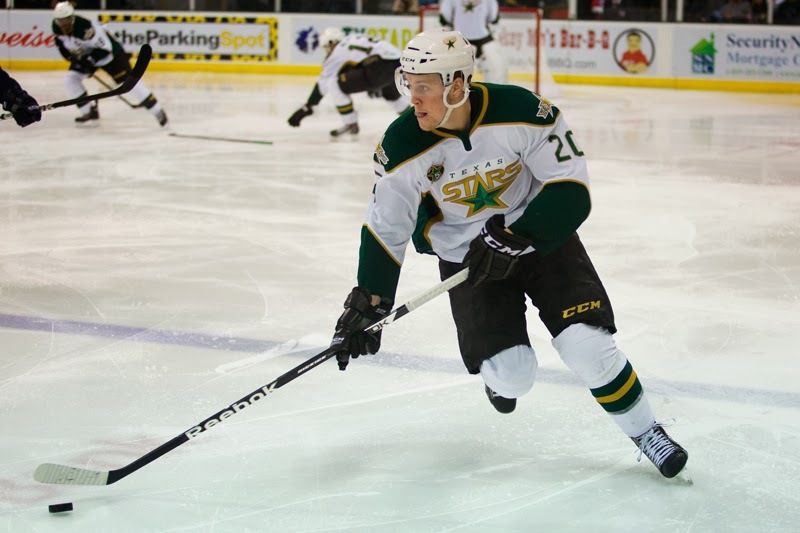 That success and the emphasis that Dallas is placing on minor league development make the Texas Stars an attractive destination for anyone looking to take that step in their career. Early bets would put good money on Doug Lidster. Coach Desjardins was always keen to point out that the Stars' success was as much due to Lidster as it was due to himself. He has been a head coach before in the OHL. Other candidates will surely arise over time, including former Monarchs coach Mark Morris, but Lidster has to be the early favorite. However, one of the rumors around the non-hire in Pittsburgh was Desjardins' concern with the assistant coaching staff. It was very set in Pittsburgh but is wide open in Vancouver. It opens the door for Doug Lidster to join Desjardins with the Canucks. 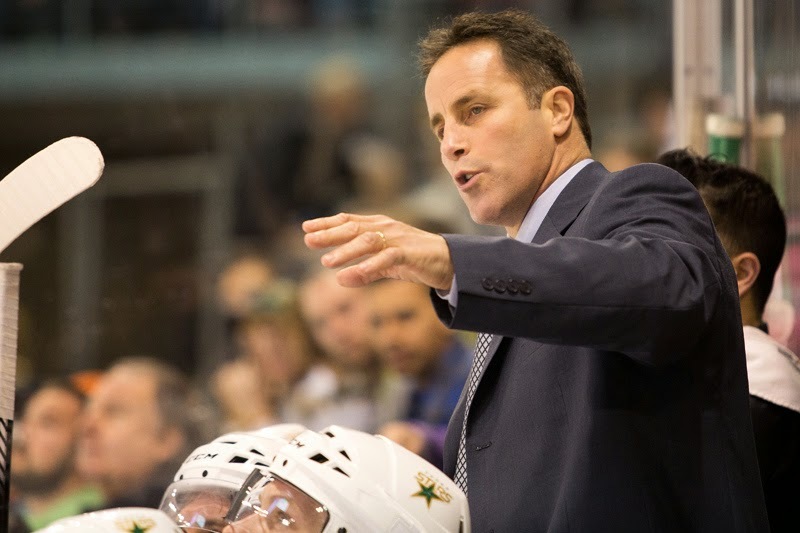 If that is true, the Canucks coaching staff will consist of three former Texas Stars coach (Glen Gulutzan was retained from the previous season). There is the assistant coach domino that then falls. 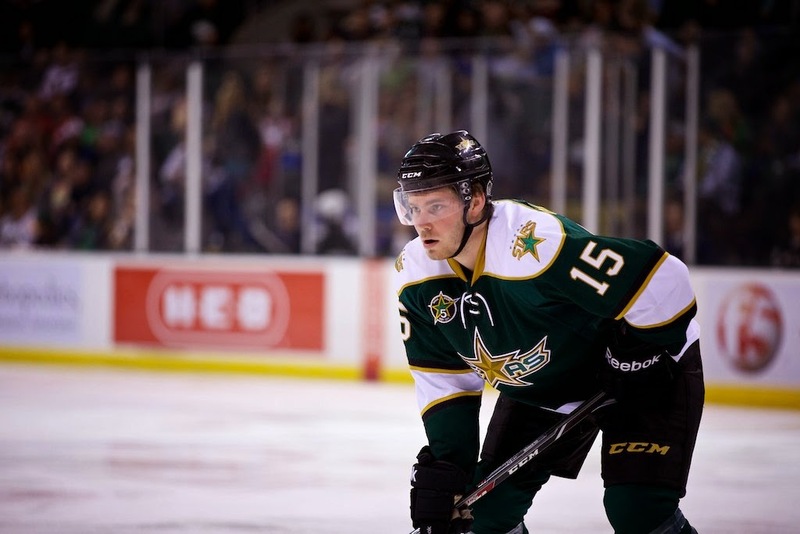 Texas could call on its ECHL affiliate and pull up Brad Ralph as one possibility. AHL head coaching positions aren't easy to predict and assistant coaches are at least twice as difficult. More will become known over the next few weeks as the team progresses toward development camp in July. For my part personally, I have always enjoyed talking with Willie. He can be cagey at times with his signature, "Oh, I don't know" in response to injury questions. But he's a very bright hockey mind, and it has been a pleasure to interact with him on a nightly basis over the past two seasons. Another day, another departed Texas Star. This time, it's Cristopher Nilstorp signing with the Växjö Lakers of the SHL. It wasn't an unexpected move after Nilstorp seemed unlikely to earn an NHL contract backing up Kari Lehtonen in Dallas. Nilstorp will return to the league where he won a championship and MVP trophy after winning the Calder Cup this season. "[Nill and White] wished me good luck and thanked me for the season," said Nilstorp last week, when he was still being coy about his future intentions. "I'm going home to relax for a bit... maybe I'll take a walk with my dog. Work on my English. I'm just really happy to go see my family." "Cristopher is quite precisely what we have been looking for. He is an experienced and talented goalkeeper who has been involved and gained a lot. It feels really good and it really feels like we found right in our goalkeeper saves. "I think Cristopher had had the chance to write a new NHL contract, but then he probably ended up as runner-up and cast as 30-year-old wants to play games. He wants to play, participate and have the chance to win something, and he gets it with us. He likes our focus and see that we are going to do any good. But just because I am sure he has not given up his NHL dream." After his time in North America, Nilstorp said that he will bring a lot back to Europe with him that he learned over here. "The game is completely different. Guys shoot the puck well and more. If I'm going back, I'm going to take that with me. All the experiences of playing such a long season will be things I take with me." 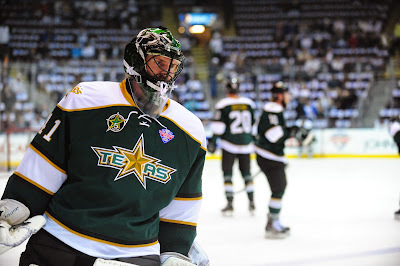 Nilstorp finished his Texas Stars career a champion after 84 regular season and 28 playoff games over two seasons. Now that the season is officially over, players will begin signing deals elsewhere. Mike Hedden is the first. The Dunnvlle, ON native signed a deal with the KHL's Medveščak Zagreb earlier in the playoffs. The team has a decidedly North American flavor with recognizable names on the roster such as Barry Brust, Mark Dekanich, Hugh Jessiman and others. 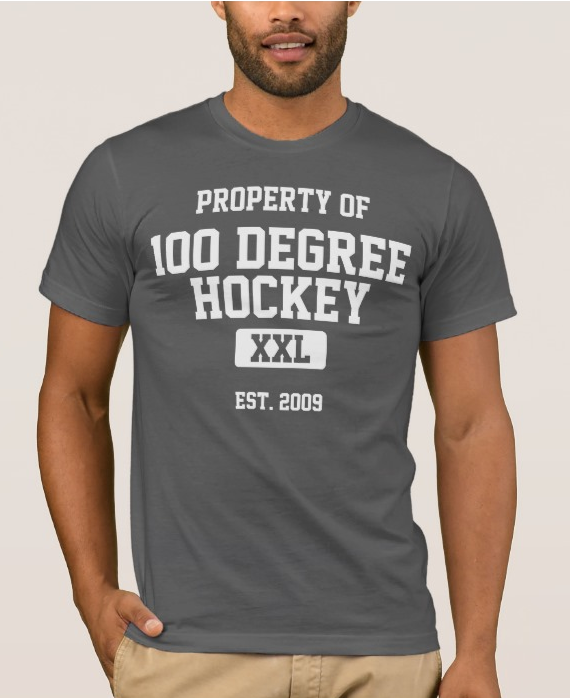 He will make significntly more in the KHL than any AHL team would have offered him. Unfortunately, with his age a factor, he was unlikely to big up an NHL two-way despite having the best year of his career. He was dynamic on a line with Justin Dowling and Brett Ritchie all season. He was certainly in the running for MVP of the playoffs after 19 points in 21 games. The team's sport director said, "Mike is coming off winning the Calder Cup for the Texas Stars this season where he had a great playoff and finished as the 2nd leading scorer in the playoffs. He is a very solid two way player who plays with some real grit and plays the game the right way. He will be a great addition to our lineup and should be able to play in all situations for us. We expect him to be a solid top 9 forward for us." Hedden's KHL carreer will start on July 31, giving him little off time in the summer. 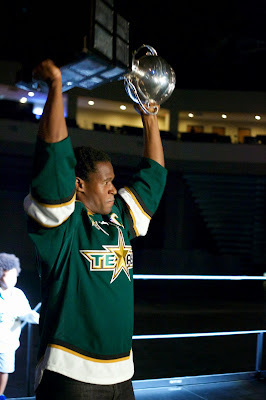 @TexasStars just want to says thanks to everyone in the organization, to all the fans and my teammates. It's been an amazing 3 years. Following the Calder Cup championship, Texas Star Toby Petersen announced his retirement after a 14 year playing career. The center was drafted 244th overall in 1998 by the Penguins and played a total of 398 NHL games between the Dallas Stars, Pittsburgh Penguins and Edmonton Oilers. 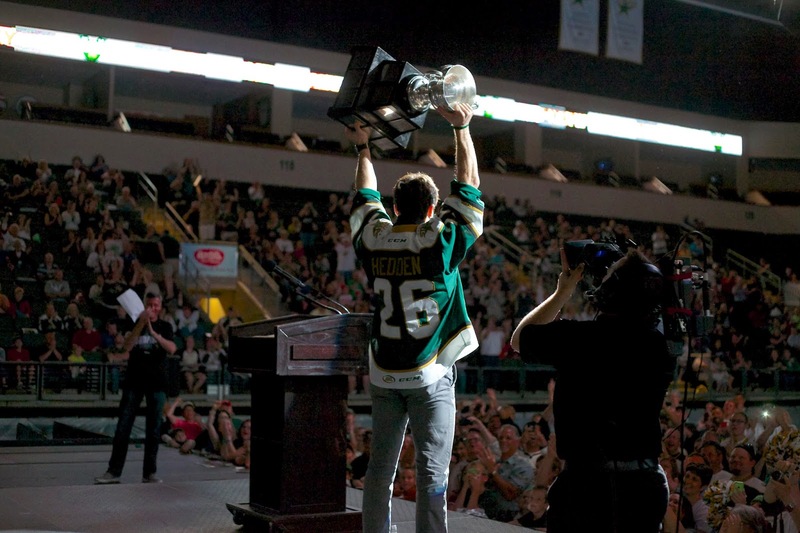 "I've known for months that it was the right decision," said Petersen after the Calder Cup rally Thursday night in Cedar Park. "There's never a good time to tell anyone when you're playing. I was watiting to stop playing. After the first surgery, I was leaning that way and then I broke my foot. A lot of factors went into the decision." Petersen was hampered by injuries this season, including a sports hernia in the regular season and a broken foot sustained against Grand Rapids. On crutches, he raised the Cup on Thursday night. "I'd love to have been out there skating it around. It's a great feeling to say I went out on top. I get emotional thinking about how hard these guys worked." The Minnesota native spent the majority of his career in the Dallas organization. He actually began his time with Dallas as an Oilers prospect in 2005-06, playing in Iowa with players like Loui Eriksson and Nicklas Grossman. He was signed by Dallas in 2007 and has played with the organization ever since. "It's been a long time in the organization and you come across some quality people in this organization. I've been so lucky to play (here) for so long. I can't say enough good things. Seeing what Dallas did and what we did here, there are a lot of positive signs." As to what's next, he's not quite sure. Typical options for players who retire and would like to stay in hockey are scouting or coaching. Petersen said he would like to go the coaching route if the opportunity is there. "I'm going to take some time and think it over. I'm not ready to move on from hockey." There is some precedent for a player to move from the ice to the bench on the same team after their last season. With the current situation of the Texas coaching staff in flux, there is some small possibility Petersen could be involved in the assistant coaching role for the AHL club. "It hasn't been discussed at all," he noted. "With Willie, you never know what's going to happen, but we'll cross that bridge when we come to it." 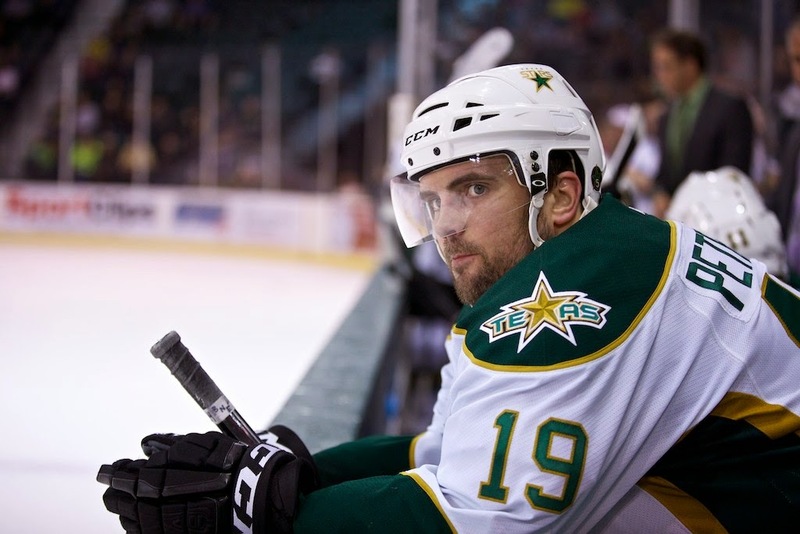 The consistently classy Petersen was a huge contributor to charitable efforts both in Dallas and with the Texas Stars Foundation in Cedar Park. He and his wife served as board members for the Foundation the past two seasons. He is likely to head back to Minnesota to be with his wife and three children before making his next move. The captain lifts the Cup. It was quite a night for the Texas Stars, their fans and the city of Cedar Park. 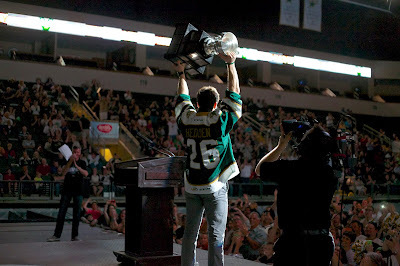 Five years after the building was opened and the Texas Stars first hit the ice, the city celebrated its first Calder Cup championship. The music was loud. The fans were rowdy. The players might have been even rowdier. 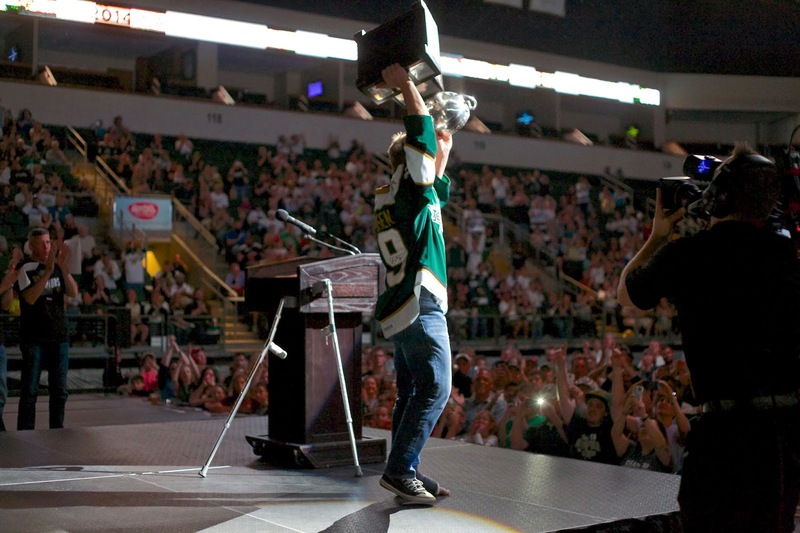 It was a well-deserved celebration of the moment that will be indelibly etched in every fan, player, coach, staff and member of the Texas Stars organization. Speech of the night was a tough competition. In the noted absence of Coach Willie Desjardins, Doug Lidster was the appointed coaching representative. Desjardins was reportedly in Pittsburgh today interviewing for the head coaching job with the Penguins. Lidster thanked family and fans but really took the cake when he decided he had to be a point-for-point stand-in for Desjardins. He pulled out the whiteboard and tried to match Coach Desjardins signature pose, writing on the board. Later he even noted that he 'forgot the rock' and started swaying back and forth in Desjardins' signature manner. After emcee Owen Newkirk opened the mic for players to speak freely as they were called to hoist the cup, the night went from good to great. Kevin Henderson took the early lead for best speech, frankly stating that he was not having a good year in Milwaukee and jokingly thanking Chris Mueller for single-handedly getting him traded to the Stars. Patrik Nemeth didn't speak a word of English, but had a few understandable phrases, such as "Cedar Park Center" and "Tak", meaning thank you. Hubert Labrie started a "TEXAS STARS" call and response. Chris Mueller complimented the fans, drawing on his time as an Milwaukee Admiral to tell the fans that the Cedar Park Center was the toughest building to play in for an opponent. Toby Petersen announced his retirement (which I'll cover separately). Cameron Gaunce went politician and thanked the fans for being so polite and nice to their visiting family and friends. Mike Hedden didn't speak, but revealed a hidden beer, poured it into the Cup and drank it. Brendan Ranford had some "real talk" as he put it. He grabbed the Cup, set it down close to the edge of the stage, and took out a beer. He clinked it against the Cup and put his arm around it. It was a great photo. The night closed out with a highlight reel of the playoff run, capped with Patrik Nemeth's series winner. "The boys", as they were referred to so many times by all the players in their speeches, erupted at the goal. Texas will do exit interviews tomorrow morning into the afternoon. Players will then start heading back to their various hometowns. Isn't it a beautiful day today? This is what it looks like to know you've just won a championship. Thanks to the wonders of social media, we can all go inside the locker room with the Texas Stars after last night's win. OT hero Patrik Nemeth and his Swedish partner in crime, goalie Cristopher Nilstorp, were all over the hashtags in this Calder Cup #selfie. The Texas Stars' fifth season was one for the history books. The storybook season came to a storybook end with a Calder Cup win tonight in St. John's. After Travis Morin scored all three game winners in the series up to now, it was an extremely unlikely candidate ending this one in overtime: Patrik Nemeth. Only his fifth North American professional goal ended the 2013-14 season in the fourteenth minute of the first overtime period. It was a beauty of a goal that ended the series. The defensive defenseman stepped past St. John's Jordan Hill and backhand roofed one past the glove hand of Michael Hutchinson. The Stars flooded the ice as the team celebrated its first Calder Cup in franchise history. Travis Morin, who had 22 points in 21 games this playoffs, won the Jack A Butterfield Trophy as playoff MVP. It was the first time since 2008 that the regular season MVP also won the playoff MVP trophy. Captain Maxime Fortunus accepted the Calder Cup from Dave Andrews. He passed it to Travis Morin, who passed it to veteran Derek Meech and beyond to Dustin Jeffrey, Cameron Gaunce and Cristopher Nilstorp. 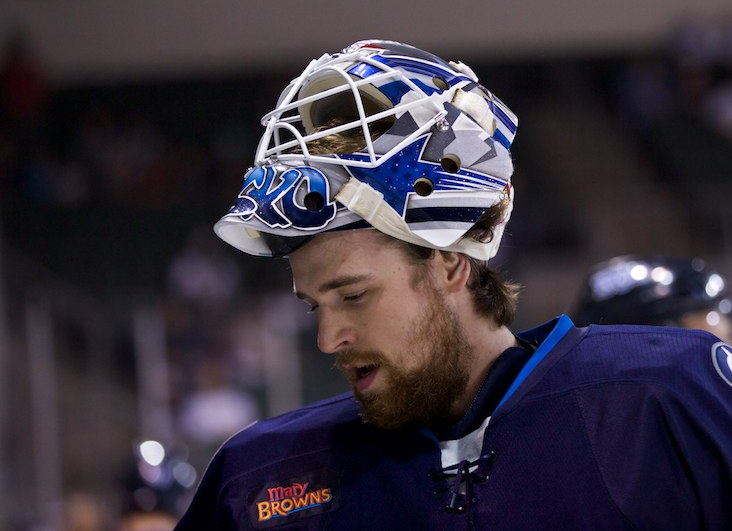 The goalie stepped up to stop 33 of 36 shots, winning his second professional championship. Mike Hedden opened the scoring for the Stars late in the first period. Brett Ritchie sent the puck up the right wing side to Hedden, who pulled it from his backhand to his forehand to go high glove on Hutchinson for the 1-0 lead. It was a tough goal for St. John's as they had played well in the period to keep Texas off the board but gave up the tally with 68 seconds left in the frame. Hedden's goal was just the sixth shot of the night. Though it spanned the intermission, the Stars scored on their very next shot. Brett Ritchie sent in a knuckler that even he probably didn't expect to go in. With two defenders on him at the blue line, the shot appeared to catch Hutchinson off guard and went in blocker side high. It was a 2-0 lead for the Stars and they were feeling pretty good. They had scored on two of seven shots to that point. The IceCaps turned the tide in the second half of the middle frame. From the point and through traffic, Jordan Hill beat Nilstorp for the 2-1 score. Six minutes later, the IceCaps would take advantage of a power play though it wouldn't show on the scoreboard. Just as Chris Mueller rejoined the team on the ice, Zach Redmond put a pass on the tape of Josh Lunden through a mess of sticks and legs. Lunden popped it in off the left wing side low with no one on him. Texas needed to play a measured game heading into the third period. Just do what they do and they would find success. The Stars were 5-0 when tied after two periods coming into the game. Looking for the D-to-D pass in the period's sixth minute, Jamie Oleksiak put the puck right on the stick of Blair Riley with no one near him. Riley lifted it over Nilstorp for the 3-2 lead on the bad pass. With their chances to close things out dwindling, Mike Hedden stepped up again. Justin Dowling passed the puck into the slot off the left wing side. The IceCaps defender popped the puck up into the air with his stick and into the body of Hedden. Off his left hand, which was gripped over the stick, Hedden knocked a rainbow of a puck over Hutchinson for the three all tie. The goal went to review but the call stood, despite the protestations of St. John's. Overtime was fast and frenetic for Texas and St. John's. The two combined for 18 shots in the extra period. Nemeth was the OT hero. He burned Jordan Hill on the play and roofed one over Hutchinson for the 4-3 win and the Calder Cup championship. It was a yard sale as the Stars shed their gloves and helmets to dogpile Nemeth in the corner. Texas will return home tomorrow and celebrate its win with its fans on Thursday. "One of the trademarks of an elite organization is their ability to train and develop players in a winning environment," said Dallas Stars General Manager Jim Nill. 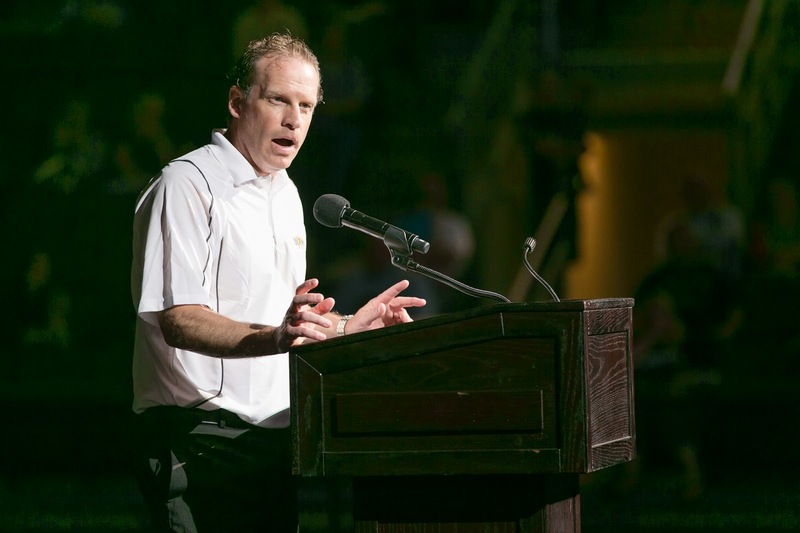 "The Texas Stars have done a great job with all of these facets this season and I know firsthand that the rewards from winning the Calder Cup will have a profoundly positive impact for each of our prospects and our team in Dallas as we move forward. We congratulate Scott White, as well as Willie Desjardins, the players and the rest of the Texas Stars staff for an outstanding season." 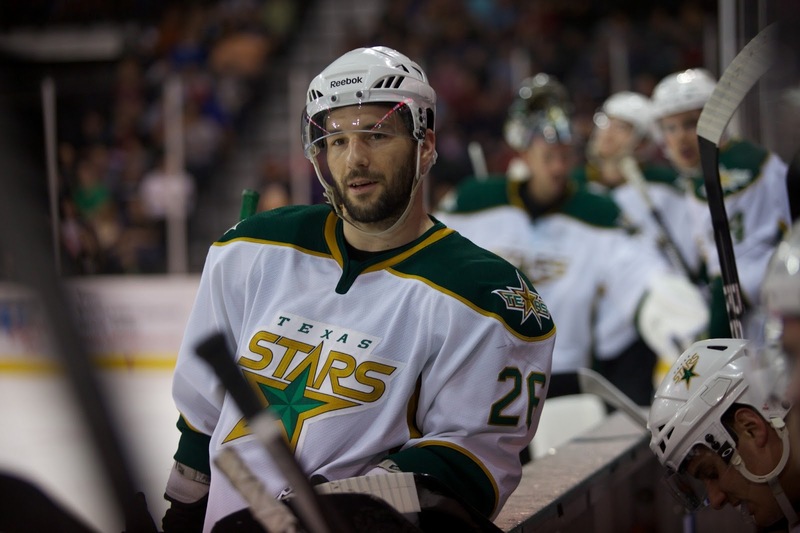 Could tonight be the night for the Texas Stars? 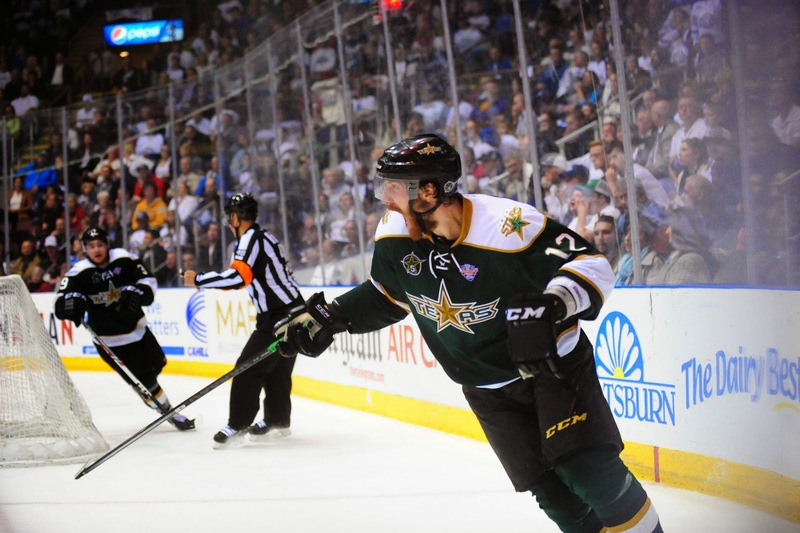 This is the first chance the Stars have at clinching the Calder Cup. Texas is 3-1 in potential elimination games this playoffs. Their only loss came in Game 6 against Toronto with a chance to close out the Marlies for the Western Conference title. The Stars would win that series in Game 7. After coming so close in two straight games, the IceCaps are focusing their games on 'one period' to get started, according to St. John's coach Keith McCambridge. Desjardins indicated that last night's game felt a lot like Game 3 in terms of the turn around that was needed from one of the teams to make it through to overtime. In Game 3 it was St. John's. Last night, it was Texas. However, in both, the Stars triumphed off the stick of Travis Morin. "The first goal from Morin you could feel we were on our heels," said McCambridge. "We changed out style of play a bit and opened it up. We got away from what has given us success." The comeback last night, while not the perfect scenario from a coaching standpoint, just bares out the will to win that the Stars have had all season. You can say all you want about being a third period team or having the ability to comeback from behind. Texas has legs to stand on when they make that claim. Last night's win typified their style all season. Not that they needed a lot of come from behind wins in the regular season. However, they made hay in the second and third with energy that other teams simply couldn't match. If you look at last night's game, the Stars outshot the IceCaps 38-35 on the final tally. That is after being down 29-6 halfway into the game. It was a tale of two halves. After the Mouillierat 5-on-3 power play goal, Texas outshot St. John's 32-6. They were assisted in large part by a resurgence of their top line. Brendan Ranford and Curtis McKenzie may not have gotten the headline last night, but both were key pieces of the win. Somehow Ranford did not get a star in the game despite having three assists. Curtis McKenzie also missed the star listing with a goal and two assists himself. And hasn't that been a key to Texas' play all season? Tonight's Morin and Ranford; tomorrow it's Ritchie and Hedden. The next it's Dowling. Then, Jeffrey or Glennie or Mueller or McKenzie. The talent level of this team all season has been otherworldly. The skill of this team cannot be and should not be written off by anyone. Certainly not opposing teams and most definitely not the fans of the Cedar Park club. It's rare. If this ends up being the last game, take some time to enjoy it. Drink it in and know that you were witness to something special. Halfway through Game 4, it looked like this series was heading for a two game each tie. Three goals for the IceCaps and a 29-6 shots lead made it look like a forgone conclusion. 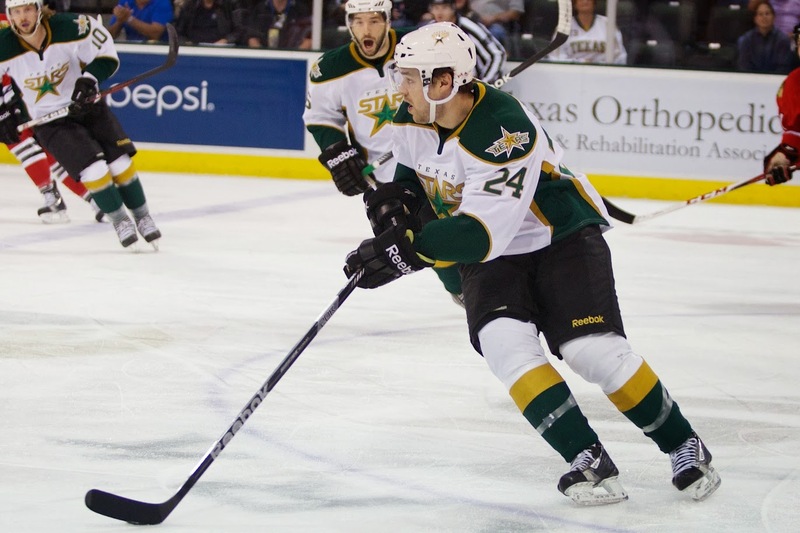 The AHL MVP, Travis Morin, both started and finished a comeback that saw Texas score four unanswered goals. The Stars erased a three goal deficit to take the game to overtime. Then their top scorer stepped up to take Texas within one win of the franchise's first Calder Cup. The Stars outshot the IceCaps 38-35 overall and 32-7 in the second half of the game. With the win, Texas moved to 5-0 in OT this postseason, setting an AHL record for road OT wins in a postseason. The Stars were facing a barrage of shots in the first period. The only thing keeping them in it was the play of their goaltender, Cristopher Nilstorp. Two early penalties put the shots at 14-4 for the IceCaps. The Stars managed to get some power plays of their own but ended up on the wrong side of the man advantage, giving up a shorthanded goal to St. John's. Right off a faceoff in the Texas zone, defenseman Ben Chiarot put up his second of the postseason on one that eluded Nilstorp from the point. Texas finished the first down on shots 21-5. It wouldn't get much better in the second period as Carl Klingberg scored in the first minute of the frame. On a break up the ice with Kael Mouillierat, Klingberg finished off a backhanded chance, beating Nilstorp glove side as he couldn't close off the post. The Stars kept up that penalty trouble as the period continued, getting down two men at the halfway point of the frame. Mouillierat continued his scoring ways with his fourth goal in as many games in the finals, making it 3-0. The shots were 29-6 in the game at that point. Texas got its rally going off the stick of their AHL MVP. Brendan Ranford worked the puck from the corner behind the net, getting Michael Hutchinson moving side-to-side. The rookie passed the puck out to Travis Morin in the slot for the 3-1 score. Just a few minutes later, Curtis McKenzie finished off a frantic cram play at the net off the assists from Morin and Ranford. With the score, Texas drew within a goal. By the end of the frame, Texas had outshot the IceCaps 17-10 in the period and 16-2 in the back half of the second. The Stars poured on the shots as the third period started. Michael Hutchinson continued to come up big in pressure situations. Six minutes in, he robbed Dustin Jeffrey of the potential game-tying goal on a great glove grab. 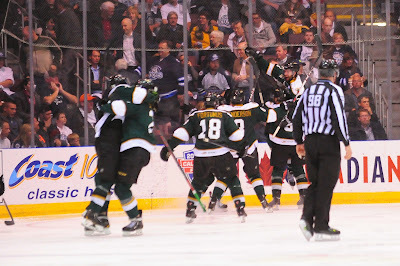 A few minutes later, Brett Ritchie appeared to have the goal on a play that went to review. All the replays shown on television showed the puck was in, but the overhead view is the only one usable for the referees at ice level. The initial call was no goal and Hutchinson's glove blocked the overhead view of the puck, preventing a change of the call on the ice. It stayed 3-2 St. John's. Ritchie would get it back a few minutes later off a sage play from Justin Dowling. Charging down the ice, Dowling sent the puck to the slot, where Ritchie wristed it past a falling Hutchinson to tie things at three. As the period ended, Texas had one more chance to take the win. The captain, Maxime Fortunus, put it off the iron with five seconds left. After trailing 21-5 in the first on shots, the Stars pulled to a 37-34 lead after 60 minutes. The only shot of the overtime was the one that ended it. Brendan Ranford broke in off the pass from Curtis McKenzie and drew three IceCaps. Luckily for Texas, that left Morin completely uncovered. He went glove side high across the body on Hutchinson, popping the water bottle and taking the score to 4-3. 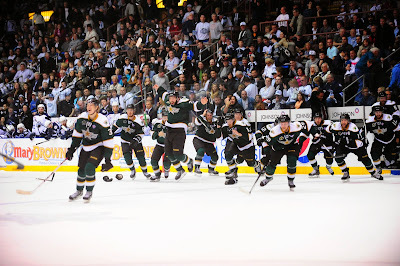 Tomorrow's Game 5 will be the Stars first chance to clinch the Calder Cup. Oh, hey, welcome back. There's still hockey to be played. After a full four days off, Texas will take to the ice for Game 4 against the IceCaps. Up 2-1, they've managed to regain their home ice advantage by winning Game 3. With two solid goaltenders, it was about time that the Stars put in some overtime. It's an extremely good thing that Texas has been so good in overtime. You might think that a team that does most of its business scoring in bunches would have hit-and-miss overtime luck. However, in this postseason, they are 4-0: two 3-2 wins at OKC, a 3-2 win at Grand Rapids and now a fourth, 2-1 this time, against St. John's. It's even better to note that all of those wins have been on the road. The key to this evening's game will be the first period, even more so than in the others. With four days off, both teams will be re-finding themselves and each other on the ice. The Stars, for their part, took two days off (Thursday and Friday) and went hard in practice Saturday and Sunday. It still seems likely that the IceCaps get one game in St. John's. If the Stars do manage to get all three, that would of course be phenomenal. However, it just doesn't seem like they will be able to do it given that crowd and how closely they played each other in Game 3. This starts another three games in four nights sequence for the teams. Tonight's game will be followed tomorrow less than 24 hours later. If St. John's wins either game, the Stars will get one more home game on Thursday after long travel again on Wednesday. With the Kings' Stanley Cup win last night, the AHL Finals between the Stars and IceCaps are the only remaining undecided championship. As we wait for the Calder Cup Finals to resume, it becomes closer and closer to a number of key dates in the offseason and the 2014-15 regular season as well. Part of the challenge of repeating a win or even a visit to the Finals is the challenge of a shortened offseason. If the series goes to Game 7 on June 23rd, there will be very little time prepare for all sorts of offseason front office activities and also for the players' to rest and recover. First, the draft is just four days later. Starting on June 27th in Philadelphia, the 2014 NHL Entry Draft will kickoff player acquisition for the summer. The draft will wrap up the next day, June 28th. Two days later, qualifying offers are due for restricted free agents at 5:00 PM ET on June 30th. Then it really gets interesting. Unrestricted free agency begins on July 1st (Canada Day). Most players who are big names at the AHL level tend to be snatched up around the July 5-10th timeframe. Chris Mueller, for example, was signed by Dallas on July 8th last year. Also for reference, the big trade acquiring Tyler Seguin last year happened on July 4th. Shortly thereafter, most NHL teams will hold development camp for their drafted prospects and many of the players who are expected to play in the AHL in the coming season. Training camp is two months later and then the whole thing starts over again. Moving into speculative territory, the Stars could also be looking at new coaching options for the coming season, which is another piece of the puzzle you want to get into place as soon as possible. Vancouver had stated a desire to get their coach in place before the draft. The Canucks are rumored to be hot on Kings assistant coach John Stevens and Texas Stars head coach Willie Desjardins to replace the fired John Tortorella. In both cases, they were waiting for the playoffs to end for each team before contacting the coach. Stevens is now fair game. Desjardins is still on lockdown. Not a lot of time for them to make the decision if it goes to June 23rd. If Desjardins leaves the Stars, Texas will have to find a new head coach, a new assistant or possibly both depending on what happens. It's not out of the realm of possibility that Desjardins would ask Doug Lidster to come with him to Vancouver. Lidster grew up in Kamloops, BC, and spent ten years of his professional career with the Canucks (1983-93). He could also move to the head coaching role in Texas if Jim Nill and Scott White feel he is ready for it. Finally, the players will have just two months to rest and recover before jumping back into hockey activities. Usually you take a few weeks off from all hockey activity before going into your summer training plan. Players who might need surgery for nagging injuries get that done immediately and have a while to recover. Obviously all that is a ways off, but it's something to ponder as we steam toward July. With building conflicts on both sides of the conference, it's a weird Calder Cup Finals schedule this year. Two sets of three games in four nights and gaps of four and three off days between games set up the strange schedule. However, it's all due to building availability. The Mile One Centre has had this weekend booked for the Canadian Anesthesiologists' Society annual meeting since 2009. At that point, the IceCaps were still in Manitoba as the Moose and no one knew there would be a team in the city for another two years. To be fair, if there's one group of people you want to be good at planning ahead for things, it's anesthesiologists. The schedule may actually make history if it goes to six games. June 19th or 23rd would be the latest in the year that the AHL has ever concluded its season in more than 75 years as a league. To this point, the latest the Cup has been won was by Grand Rapids on last year's June 18th date in Game 6 at Syracuse. If St. John's wins another game, Game 6 will be guaranteed, which will break that record. What will not set a record is the gap in play that the teams will see this series. Four days is nothing in the history of the AHL. Going back just 25 years reveals a seven day gap in 1989's series between the Adirondack Red Wigns and New Haven Nighthawks. After the Red Wings won Game 4 by a 6-0 score to go up 3-1 in the series, they had seven days offs before playing again. They closed out the series in a wild offensive duel, which they won 10-7. Further analysis of the years since shows a lot of four day gaps. Of course, most of those came as teams switched cities in the series. Texas even took part in a long delay in the Finals in their first year. Hershey wrapped up their Conference Finals on May 22 and Texas finished theirs on May 26. The two teams wouldn't square off for the Cup until June 3rd due to building availability issues at GIANT Center. That was a gap of seven days for Texas and eleven for the Bears. 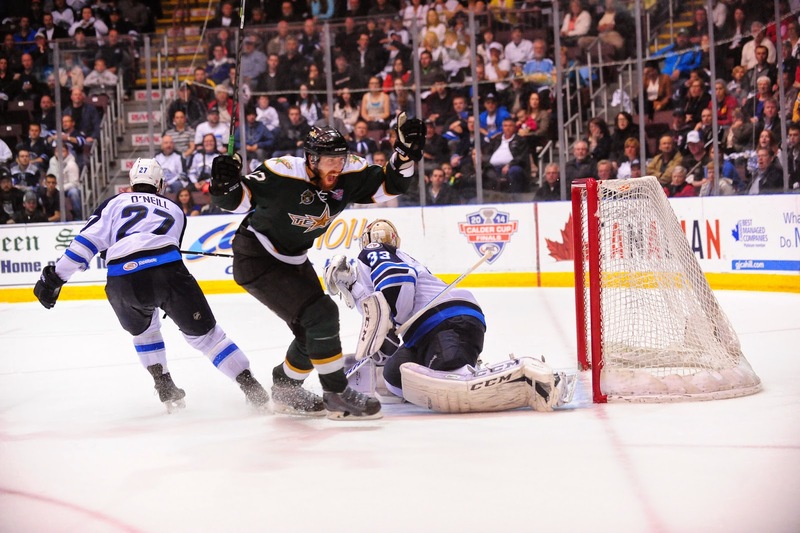 The AHL's MVP made his case that he should be in the running for the playoff MVP as well with a clutch overtime goal to take the series advantage for the Texas Stars in Game 3 in St. John's. Travis Morin was the OT savior for the visiting Stars, scoring his seventh of the postseason. Texas managed to keep the crowd out of it by scoring first, getting on the board in the second period thanks to Brett Ritchie's fifth of the playoffs. IceCap Kael Mouillierat put the score at a tie and got the sellout crowd back into the game in the third period, forcing OT. The Stars top line made their impact in the extra frame. All three forwards were involved in the play that ended the game at a 2-1 win for the Stars. An even first period on the scoreboard was lead by the Stars in intangibles. They managed to turn things against the IceCaps and do some work with their own forecheck. After one, Texas led on shots 12-7 but neither team had scored. Carl Klingberg had St. John's best chance of the second period, hitting the post two minutes into the frame with Justin Dowling in the box for a rare minor penalty. Travis Morin had similar luck in the ninth minute of the frame. With Texas on the power play, Michael Hutchinson slipped right to left in his crease deftly to glove what looked to be a sure goal from the AHL's MVP from the right wing circle. With just over four minutes left in the frame, it was rookie Brett Ritchie breaking through. His fifth of the postseason broke up a streak of 55 straight saves by Hutchinson getting Texas on the board with his fifth of the playoffs in the second period. His line was dynamic again, generating the goal off the rebound of the Justin Dowling shot. Mike Hedden picked up the second assist, his 17th point of the postseason in just 19 games. The Stars more than doubled up the IceCaps on shots in the frame, putting them at 26-13 after forty. Texas got into penalty trouble in the third, getting outshot 6-0 early in the frame. Jyrki Jokipakka had the best play of the PK, swatting away a puck that had trickled behind Nilstorp while killing the Henderson slashing minor. Finally, St. John's pierced the Swedish goaltender at 11:44 of the third. Zach Redmond's point shot for the right side was tipped around Nilstorp by Kael Mouillierat. It was Mouillierat's sixth of the playoffs and third of the series. He has scored in every game so far. By that point, shots were 14-3 for St. John's in the period. The two teams ground out the remaining minute of the third and headed to overtime. Josh Lunden had what seemed to be the game winner early in the extra period. The whistle had blown and the puck squirted out to his stick. He roofed it and the goal light went off. It was a no-goal and a lucky one for the Stars. Texas was awarded an early power play in the extra frame but squandered it. It wasn't for lack of trying. Ritchie had the best chance of the advantage with a point blank chance on Hutchinson that the goalie collected in highlight reel fashion. The Stars top line came down the ice after the power play expired and ended the contest. Curtis McKenzie dropped a pass for Brendan Ranford. He found Morin through traffic on the back post for the easy tip-in goal and the 2-1 win. Texas now has the 2-1 series lead and four days off to practice and heal up. Game 4 is Monday in St. John's. That was the mantra from the Texas Stars anytime they were asked about playing in St. John's. Any arena, any night, it's just 200x85 of frozen water with the same rules as any other state or province in the AHL. 6,287 full-throated fans might tend to disagree. 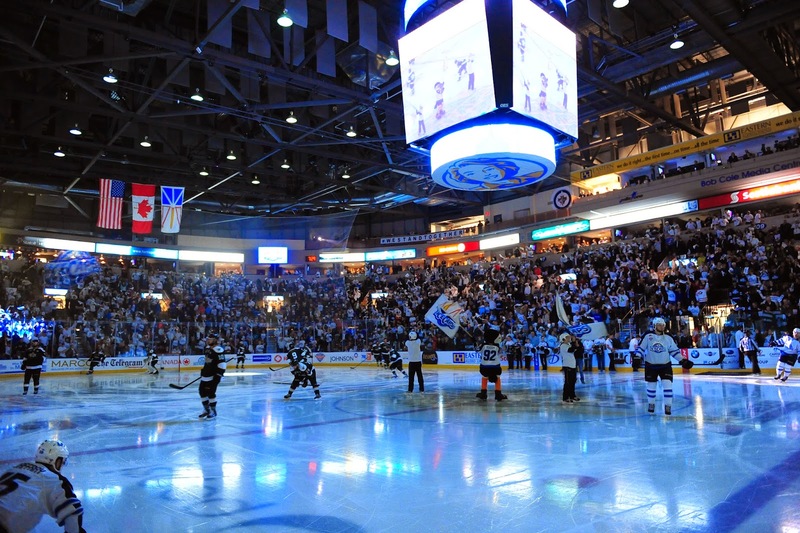 The IceCaps have sold out Mile One Centre every game in their franchise history, a streak of 130 games. Tonight figures to be 131. They might even pop over 6,287 depending on whether they will allow standing room only seats. The Stars set a capacity record in 2010 by selling standing room only seats for all three games at the CPC. Game 5's attendance of 7,054 still stands as a building record. The main question of the night seems to be whether Texas can weather the new environs and power through to a win to regain their home ice advantage. If the Stars repeat what they did two nights ago in Cedar Park, hurling 50 shots on Michael Hutchinson, they are likely to get a better result. It would be a gargantuan performance from the Barrie, Ontario, native to stop enough of 50 shots to get a win again in Game 3. The Stars have been in this situation once already in the postseason. In the Western Conference Finals, Toronto took Game 1 and Texas took Game 2. The Stars took games 3 and 5 in Toronto and came home to win in seven. In Grand Rapids, Texas dropped Game 3 and 4 and had to eek out an OT win in Game 5 to come home and clinch in six. Big keys for Texas include the obvious of scoring first. Taking the crowd out of the equation is something that can't be overlooked, and scoring first will do that. Referee crew from the first two games also traveled with the teams to St. John's. Based on games 1 and 2, expect a low penalty minute affair. Players, coaches, staff, referees, linesman, league officials and some media piled onto a charter this morning bound for St. John's, Newfoundland. It's a seven hour flight with a two and a half hour time change. Luckily, the Stars are in the same boat (or plane, if you will) as the IceCaps here and will be facing the same travel weariness. Texas said that, for its part, they were going to be treating the game like the third night of a 3-in-3, given how little rest there will be in between the two contests. "It's a grind for both teams," said Dustin Jeffrey last night. "One of our strengths all year has been our ability to roll four lines. Playing the end game of a three in four nights, that is going to be huge for us." As you would expect, the IceCaps have long sold out tomorrow's game. They have sold out all 130 regular season and playoff games in franchise history and the first game of the Finals on the Rock is no exception. "It's a tough building to play in. They get a rowdy crowd. We're going to have to be ready to take their crowd out of it." In the ECHL, the Alaska Aces wrapped up a 4-2 series win over the Cincinnati Cyclones last night in Ohio. Goalie Rob Madore, who has always played well against the Texas Stars, was the playoff MVP in the losing effort. It was interestingly the first time in the ECHL's history that the MVP was awarded to a player from the losing team. In the NHL, the Los Angeles Kings lead the New York Rangers 3-0 with a potential clinching Game 4 on Wednesday night. If the Kings complete the sweep, the AHL would be the last remaining game in town for the 2013-14 hockey season. Games 4 and 5 of the Calder Cup Finals will not be played until June 16th and 17th. Game 5 is guaranteed to happen now that the teams split the opening pair of games. Even if the NHL Final goes to seven games, the AHL is still likely to outlast its parent organization. Game 7 of the Stanley Cup Final is June 18th. Games 6 and 7 in Texas will be June 19 and 23, if necessary. It's interesting this time of year to see the reactions of all the new eyes on the league, team and its prospects and coaching. A slew of articles were written this week about Scott Glennie coming back from the dead this season. Dallas fans had mostly written off the former first round pick after injury issues and inconsistency put him down the depth chart. Sunday's game changed that for many as he had two goals, an assist and even added a fight. It's good for him as a player to get this exposure and perform well on a big stage. He will likely never meet whatever sky high expectations that there are for a top ten pick. However, if he can find a niche in Dallas in the bottom six, he'll certainly take it. Once again, the Stars' high powered offense ran into a buzzsaw of a goaltender as Michael Hutchinson had a 49 save effort to give St. John's a tie in the series. "I was a little bit more prepared tonight than last night," said Hutchinson. "I knew I could play better, take little things from that game and be better prepared tonight." St. John's coach Keith McCambridge ranked his goalie's performance in the top three he's seen all time, "It wasn't even a rebound game. He played the way he has all playoffs for us. He was definitely the best player tonight." The IceCaps scored first and never trailed in the game. Even so, Texas felt they played a better game than in the opener. They just ran into some hot goaltending once again. "It was a good effort," said Coach Desjardins. "I think we played better tonight than last night. There's nothing you can do [about a hot goalie]. You just have to move on." Dustin Jeffrey added, "We created a lot of chances, but I think we didn't get the shots we wanted." Texas controlled the early play and had the first four shots of the night. The IceCaps scored on their first shot to negate all of that good effort. "We are well aware of the momentum that can build in this building. That first goal was huge," said McCambridge. Kael Mouillierat finished off a two-on-one against the Stars captain, Maxime Fortunus. Eric O'Dell slipped the puck to the crease past the defender for the waiting Mouillierat to make it 1-0. Texas poured on the shots, ending the first at 16-9. Michael Hutchinson stoned more than a few chances in the period, including a point blank chance by Curtis McKenzie off a nice pass from Brendan Ranford. The Stars would make good on that original opportunity on the first shift of the second period. Ranford popped one past Hutchinson off the pass from Morin just 29 seconds into the middle frame. "Disappointed that we gave them some momentum in the second," said McCambridge. "If you give Texas time and space in the offense zone, you can see what happened with that goal." It wouldn't last long as the IceCaps put in one of their own off the stick of Blair Riley on the one timer just 44 seconds later. It was a crucial fourth line goal that would stand up as the winner. "We were very up on the bench and felt momentum was coming [our way]," said Kevin Henderson. "Having an answering shift like that [from St. John's], it's not so much deflating but it hurts." St. John's hemmed the Stars in for most of the period from there. While Texas had its chances, the IceCaps had even more. The forecheck of the visitors generated turnovers and shots on Cristopher Nilstorp. The Swede was called upon to make quite a few big saves in the stanza, holding Texas to a 2-1 deficit after 40. Shots were only in their favor 30-27. Hutchinson showed his true mettle in the third period, turning aside all 20 shots he faced, including several grade A chances from a variety of players. "He wasn't showing us that much," said Ranford. "He made some unbelievable saves in the third. Mueller had the breakaway, Henderson had that one in the slot, and I had the wrap around he was right there for." Kevin Henderson's chance was the best the Stars had in the third. Point blank he had to double clutch the shot, giving Hutchinson just enough time to recover for the save. McCambridge called it his goalie's best save of the night. With time winding down, Texas pulled Nilstorp to no avail. The Stars' tender finished with 33 saves on 35 shots. The Stars and IceCaps now take the long charter flight to St. John's for Game 3 on Wednesday. To say former Texas Stars goalie Tyler Beskorowany has had a wild year would run the risk of understating it a bit. 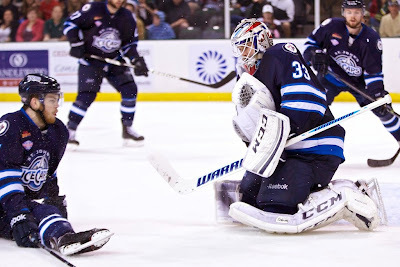 After starting the season in San Francisco with the ECHL's Bulls and then finding himself unemployed mid-season, he has played in Florida and Newfoundland en route to a Calder Cup Finals berth with the IceCaps. "It's been a whirlwind," said Beskorowany ahead of Game 1. "It's been a learning curve. Everywhere I go, I learn a little more. I've learned a lot in St. John's, and I've found what works for me. It's showed in the games I've gotten here." After being drafted by Dallas in the second round in 2008, he spent 2010-11 split between Idaho and Texas before playing all year in Texas in 2011-12. 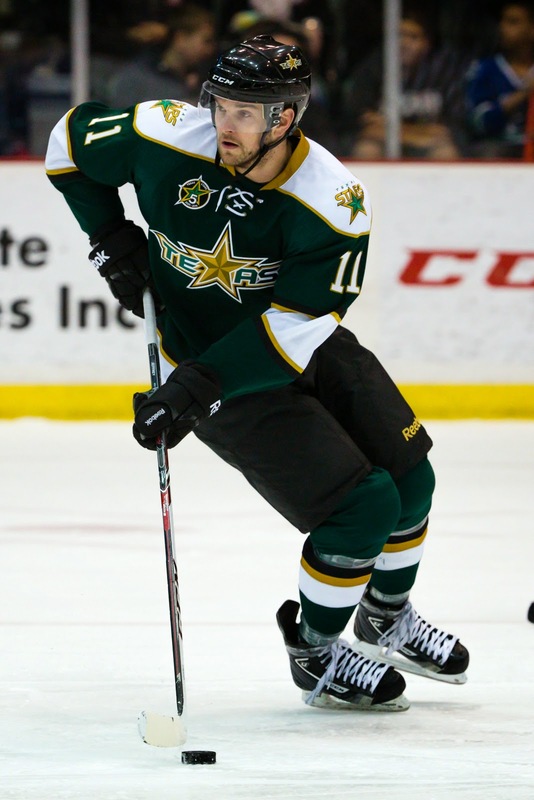 His 2012-13 campaign with the Steelheads was his last in the Stars organization as they did not tender him a qualifying offer last summer. As a free agent, the Ontario native chose to sign with the ECHL's San Francisco Bulls. It gave him a chance to be a tryout signing for any AHL team while working on improving his game in the ECHL. He was an ECHL All-Star in his rookie year. The Bulls folded mid-season, a rarity nowadays for professional hockey clubs at the AA level. Beskorowany was a free agent and unemployed for the first time in his pro career. With his season over in SFO and no AHL team to reassign him, Beskorowany went home to Sudbury to wait for his next move. "I packed up and went to [ECHL] Orlando from there. I was there for a few days and then St. John's came calling and said they needed me. It was good to get into a few games in Orlando. I hadn't played since San Francisco, so I got into two games there and met the [IceCaps] in Providence." Beskorowany went 7-2-2 with St. John's this season, playing crucial games in late March and early April with Michael Hutchinson in Winnipeg and Eddie Pasquale out with an injury. "I just went out and played my game. These guys are amazing. A defensive team that blocks shots. It gave me the confidence to play my game." Coming back to Texas presents an interesting set of memories and new experiences for the fourth year AHLer. "Being on the other side, it's definitely a change. I hadn't actually ever been in that dressing room until today. It's different, especially seeing the guys there and not being on their team." After his experience with the Dallas organization, Beskorowany seems to have refocused himself on his play and spent some time in honest reflection. "I didn't put up great numbers the last couple of years here. I know coming into this year I may have been red flagged a bit." He continued, "Being able to play games in the AHL and put up good numbers, I think I showed a lot of teams out there who I am and the character I have to be able to bounce back from what I've been through. I think I made a good name for myself, but we'll see through the coming free agency." Finally, though Beskorowany has yet to play in these playoffs, he knows it's a possibility on any night. In this series, it could happen against his former team and in the Cedar Park Center against the fans that first welcomed him to the AHL. "It might be mixed emotions. I think I left a good name here when I left and the crowd really liked me." He added, smiling, "But I've seen Matt Climie come back here, and he didn't get the warmest of welcomes. I don't know how they'll react." Texas took game one and they are certainly happy about that. However, you don't get to the Calder Cup Finals by resting on your laurels. The Stars didn't allow themselves much celebration before looking ahead to what needed to get better in Game 2. "For us we have to do a better job of accepting their pressure and using it for our advantage," said Dustin Jeffrey. "Obviously taking the first game is huge, but we see a lot we can improve on." "Now we know what we have to do and how we have to adjust." The Stars have infinitely more knowledge today than they had 24 hours ago about how the IceCaps play. Their assessment of St. John's as a hard forechecking team was accurate. Texas managed to put that forecheck to work against them. With the IceCaps over-committed to the forecheck, Texas was able to get the Chris Mueller goal, for example. It doesn't seem like Texas would change anything with their lineup. They have to be pretty happy with where they are. The same lineup that carried them through the playoffs to here worked last night and will keep them afloat. The Stars managed to inflate Michael Hutchinson's numbers quite a bit, as he allowed as many goals last night as he did in the past five games against Wilkes-Barre/Scranton. It was just the second time in these playoffs that he has had a save percentage below .900. Texas wouldn't admit it, but the book on Hutchinson seemed to be high glove. When the Stars got open looks, that's where they went. One wrinkle that might possibly be in this game tonight would be Jack Campbell. I don't think Coach Desjardins puts him back in the series even now that's he's healthy. Nilstorp battled through the Marlies series on his own and it's clearly become his series to win or lose. We'll make sure at morning skate.